A collection of Photographs of Arkwright Town just prior to the start of the Opencast. 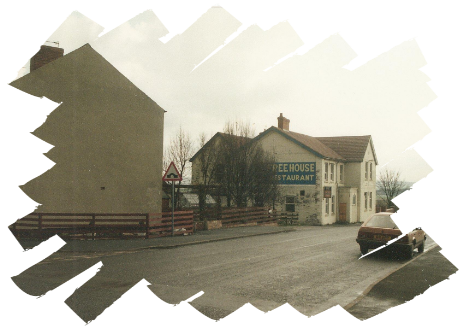 It shows the old village prior to demolition and the site of the new village prior to work commencing. Many thanks once again Brian. Why will the village cross the road? : School, chip-shop, post-office, pub: Arkwright Town is a small Derbyshire mining community, typical of those that once dotted the coal regions. Now British Coal wants to start opencast mining, which means destroying the old village and building a new one right next door. WHEN Kath and Sam Swain move into their new bungalow, like anyone else they'll have mixed feelings about leaving their old home. Sam was born there 59 years ago, and the two of them have spent their whole married life in the small brick terrace in Arkwright Town, Derbyshire. But at least they won't have to worry about losing touch with their old neighbourhood. Because all 400 of their neighbours will be moving with them. The entire village is going to be knocked down and rebuilt on a new site just over the road. Arkwright Town is, in fact, a small mining village that dates back to 1897. On the main route half-way between Bolsover and Chesterfield, it is not the sort of place that attracts a second glance. It consists of just five rows of brick terraces, with a school, pub, post office, Miners' Welfare, and a fish and chip shop. It is typical of the numerous tiny but independent mining communities that dot what were once the thriving Derbyshire coalfields. With most of the surrounding pits closed and about a quarter of its inhabitants unemployed, there was little to set Arkwright apart from any other pit village. Until six years ago. One evening in November 1988, a flash of blue flame in what should have been an unlit fireplace caused one of the villagers to call out British Gas. When the technician arrived, it was found that though the leak was certainly gas, it was not from a source anyone expected. Methane was seeping up through the rock strata beneath the village and building to potentially explosive levels. Immediately, half of the 174 houses were evacuated. As a mining community, the villagers were familiar with the dangers of methane. Also known as coal gas, it is produced by any carboniferous material, and when mixed with air can become explosive in confined spaces. Mines are regularly monitored for methane, and inevitably, suspicion for the seepage fell on the workings under the village, and in particular on the Arkwright Colliery itself, which had been closed just six months earlier. It was two weeks before the evacuated villagers were allowed to return home from their temporary accommodation with friends or in nearby schools and hotels. In their minds there was no doubt where the gas was coming from, especially since, as a 'temporary' measure, a pumping station was installed in the disused shaft to draw out the methane and disperse it into the atmosphere. So when British Coal refused to accept liability, pointing out that there are other, older workings in the area, too, the villagers, supported by North-east Derbyshire District Council and their local MP, Dennis Skinner, began moves to claim compensation. The claim dragged on for almost two years. Meanwhile, the pump continued to run, the suspect properties were continually monitored for gas, and the residents got on with their lives as best they could. Then, in October 1990, British Coal made an unprecedented offer. While still not accepting liability, it said it would build an entirely new village, provide a selection of bungalows and semi-detached houses, fit them with cookers, fridges and washing machines, pay all moving expenses, and give each household an index-linked 'relocation fee', then worth pounds 2,500. The total package would cost British Coal pounds 15m. Faced with the prospect of a long court battle - and the threat of legal costs should they lose - or spanking new homes with a couple of thousand pounds in their pockets, not surprisingly the Arkwright residents took the easy option. A new village, complete with mod cons and opencast mine, it would be. Opencast mining - also known as 'strip mining' - began in Britain during the war as an emergency measure, a quick and cheap way of extracting coal. The seam is exposed by literally stripping away the ground from on top of it, making it easily accessible for excavating machines - the biggest are called 'prime movers' - and dumper trucks. The resulting crater can be anything up to 150 metres deep, and follows the seam along, back-filling as it goes. Compared with deep mines, which are established on a more or less permanent basis, opencasting is relatively short-term, with the coal extraction often lasting less than a decade. The coal produced is high quality and can be used immediately, unlike deep-mined coal, which usually has to be washed. Opencasting is also less labour-intensive than deep mining and relies more on machinery than men. It has always been controversial. Its most obvious drawback is that it has a very visible presence. In addition to the obvious damage to the landscape, there is also the question of dust and noise pollution - particularly from the blasting that takes place. However, British Coal Opencast is keen to promote a new, eco-friendly image. It points out that its sites are carefully monitored, with pains taken to reduce the impact of the mines by building 'baffle mounds' to screen the operation, and by limiting the dust and noise the mines produce. British Coal also takes pride in its record of restoring sites once the mining work is completed; landscaping and returning them to a variety of uses, from agriculture to golf courses. In the case of Arkwright, this procedure will also involve removing the ugly mountains of grey muck left by the old colliery (this will be processed and an estimated 500,000 tons of coal gleaned from it) - a reminder that even deep mines are not without environmental impact. But the controversy over the ecological aspect of opencasting has been overshadowed by its political implications. With proposals to privatise British Coal due to be finalised before the end of the year, and most of its deep mines either closed or about to be, the development of new opencast sites appears to undermine the original justification for the pit closures: that the market for coal is shrinking. British Coal argues that in a fiercely competitive energy market, opencasting produces cheaper, superior coal, the profits from which have assisted the development of an ailing deep mining industry. Furthermore, it claims that its opencast operations have also suffered because of reduced demand for coal from its major customer, the power generators. In 1991-92 there were 61 opencast sites in operation. The number fell to 58 the following year, and British Coal estimates that in 1993-4 it will fall again to around 40. But while opencasting may have suffered from a declining market, British Coal still has outstanding planning applications for a further 14 sites. With the number of deep mines still being cut, accusations persist that the privatisation package is being made more attractive and lucrative by the opencast sites in much the same way that opencast coal is used to 'sweeten' and improve its deep-mined cousin. Against this backdrop, work proceeds around Arkwright Town. Some of the site has already been opencasted in the past, but on a much smaller scale, and if the application for the mine had not been linked to that of the new village, it is doubtful that planning permission for such a large area would have been given. The residents' main gripe is not the lack of employment opportunities so much as that the site for the new village - quarter of a mile away across the A632 - still appears little more than an expanse of levelled ground, criss- crossed by the tracks of numerous bulldozers. The original completion date was November 1994, roughly two years after planning permission was granted. Now it's scheduled for July 1995, prompting reactions from impatience to scepticism that the new village will ever materialise. But the ground on the new site had to be excavated and recompacted twice before it was deemed fit to build on. Then the people living in a mobile home site adjacent to it, less than thrilled at finding themselves in the middle of all this, had to be compensated and relocated. And then there has been the necessary but lengthy consultation procedure with the Arkwright residents themselves. At last, however, the first bricks and mortar are almost ready to be laid. When the village is completed, everything in the old Arkwright will have its improved, updated version in the new. With an additional 60 rented properties being built (the Metropolitan Housing Association is taking over as landlord from British Coal for most of the houses not owner-occupied), the village will also be substantially enlarged. The 35-place school will be replaced by a 105-place one, and tennis courts, bowling green, football pitches, and a parish hall are being added to the old, meagre municipal facilities. And, as a belt-and-braces measure, every building will have a gas-proof membrane beneath it. The new Arkwright will be a far cry from the existing austere rows of Victorian terraces opening straight on to the pavement. Working through the community liaison committee and the permanent project office in Arkwright, villagers have had a choice of 11 different two- or three-bedroomed bungalow or semi-detached house types, several styles of kitchen units, colour schemes, sundry fittings, and, to an extent, a choice about their future next-door neighbours. Each household has also been allotted 20 'points' which can be 'spent' on additional features, such as coving or patio doors. The emotional ties with the old Arkwright, methane and new homes notwithstanding, are not easily broken. Rex Mallender was former chief charge engineer at Arkwright Colliery, and is now treasurer of the Miner's Welfare Club. He agrees that it will probably be a good thing for the village to be dragged into the Nineties. But he still has reservations about giving up his old home. There are, however, those who claim that the current package, in which every household is treated equally, is unfair. Some of the villagers have spent more on their homes than others. One couple finished paying off pounds 19,500 for home alterations only two weeks before the proposal to move the village was put forward. Absorbed by the more immediate questions of colour schemes, point systems, and general self-interest while they wait for work on their new homes to start, the residents of Arkwright seem to be giving little thought to the other major project in their lives. Behind the railway embankment that shields the new village site, the opencast operation is already under way. Coaling began last November, and the area resembles the sort of sets used in cheap science fiction productions. It is surprisingly neat, for an operation of this sort. One side of the huge hole is a sheer, grey cliff face, cut straight down from the green field at its top. The other is a gradual, sludge-thick slope. A road spirals down to the bottom, 45 metres deep, where the earth movers and dumper trucks meander round. It is only when the trucks climb out that their scale is realised; each tyre is as tall as a man. And running across the floor in a clear stripe of black, is the reason for all this activity. At the moment the opencast operation is at the closest point it will come to the new village site; by the time the villagers move in it will have moved away and been filled in. Dennis Skinner has recently harried for confirmation in the House of Commons that all of British Coal's commitments to Arkwright will be honoured by its successors after it is privatised at the end of this year, and been assured that they will. If this happens, the whole opencasted area will be returned to green fields and woodland. A business park is also planned. A commemorative garden will mark the spot where the village now stands.